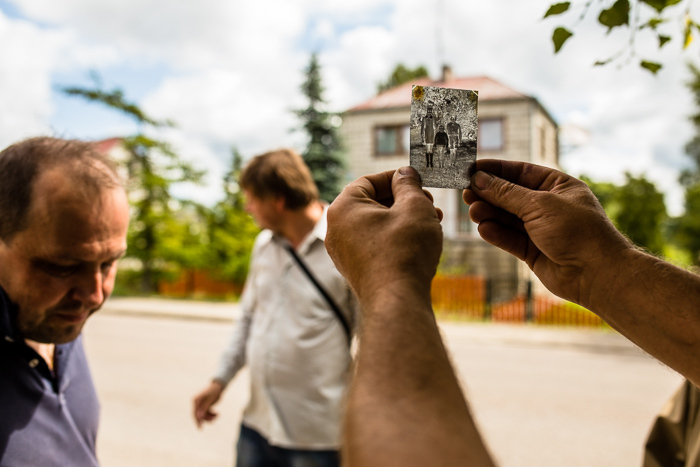 In the Summer of 2014 a group of ethnographers went on a field trip during which they visited seven towns located along both sides of Polish-Belarusian border. They were in search of old archival photography, however what they found turned out much more than that. During the course of the project the ethnographers visited seven towns located today in Poland and Belarus. They went into 60 houses, talked to families, and documented and digitalised some 2300 photographs from private archives. 800 of those are now available at Albom.pl, and a smaller selection was made it into a photo-album. We rummaged through drawers, old boxes full of papers, we browsed through derelict photo albums - some of which survived buried deep in the garden, explains one of the members of the project. The towns which the ethnographers visited were all part of Poland before WWII. Two of them still are (Gródek, Kleszczele), the rest of them are now in Belarus: Sapotskin, Lunna, Voupa, Vaŭkavysk and Kamianiets. We chose them because of their rich history, cultural and national diversity, as well as for the fact that there was so little photographical material that documented them in archives. Another factor was that we had guides in these locations. Documentation of the Albom.pl project in Belarus, photo: Rafał Siderski . ‘Rich history’ may sound like a euphemism here, especially in the context of the last century, which has left its devastating mark on this part of the world probably more than anywhere else. Over the past century, these territories, which were mostly inhabited by Poles, Belarusians and Jews, successively belonged to six different states. The once diverse population living here was severely tried during the two world wars, and the Jewish population perished almost completely in the Holocaust. In Polish towns, WWII erupted in 1939; in the areas populated by Belarusians this same period, full of dramatic tensions in the mutual relations, is referred to as “the first Soviets”, and the War (the Velíkaya Otéchestvennaya voyná) started only in 1941. 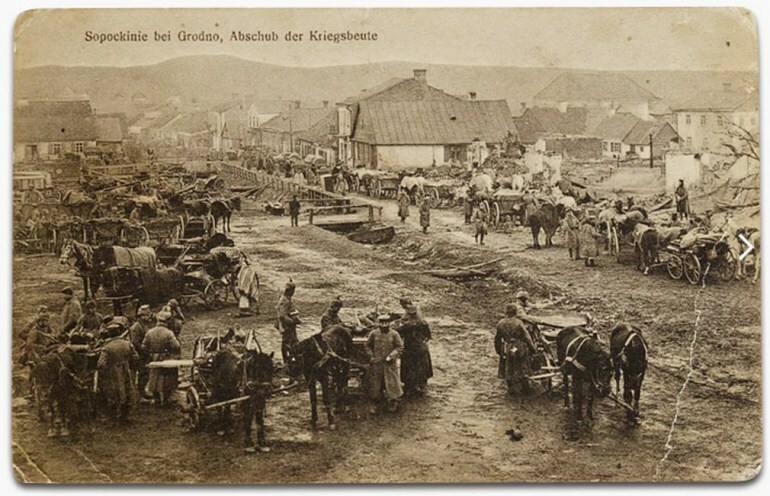 One of the most traumatic experiences for the Orthodox population (especially from around Kleshchele and Kamieniets) was bezhenstvo (Беженство) during WW1 when many families fled their homes. For Catholics the darkest era started with the Soviet transports to Siberia. For Belarusians, who are traditionally very attached to their farmlands, the biggest tragedy turned out to be the Soviet system of collective farming (kolkhoz). This tragedy continues even today. Some of this turbulent 20th century history is documented in pictures found by the ethnographers, and even the roots of those tragic events can be outlined in preceding centuries, since the earliest photographs date back to the 1880s. The biggest achievement of the Albom project lies not only in retrieving and saving from oblivion several thousand archival family photographs, but rather in making these seemingly mute images speak. This was done through numerous interviews with the people who decided to share their archives. We often felt like we were coming at the very last moment, or already too late. The last witnesses of wars are dying, and it’s getting really difficult to obtain any commentary to those pictures, says one of the participants. While many photographs were found and digitized, some will never be found. As we can read on the website of the project, they were destroyed long ago, back in the day when they were they testified to uncomfortable truths (a waste paper from Jewish houses was burned in the furnaces) or dangerous proofs (a photo showing someone in a Polish army uniform could earn a one-way trip to Siberia). During our trip we have heard from older people that their grandmothers and great-grandmothers approached photography with mistrust, just like the Africans who thought that photographing steals the soul. They warned against taking photos of newly born babies (it was admissible in the case of older children, at the age of one or so). And in fact, all of the babies we see on those pictures were photographed after their death. But there are other things and people missing from those picture as well. This pertains especially to representations of Jewish life in these archives - they are practically absent. This is especially striking considering that many of these towns before the war were typical shtetls, with most photographers being Jewish. 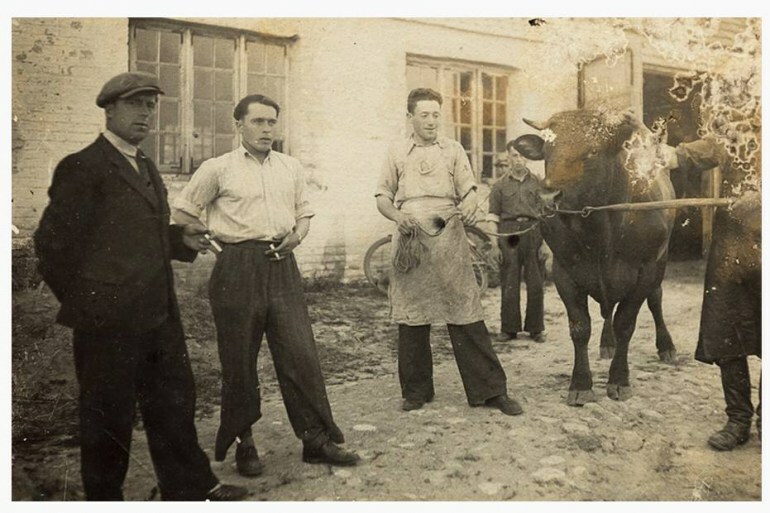 But although Jewish life hardly surfaces on the photographs, they are present in the memories of their old neighbors, as was made evident by the several interviews held by the Albom team. This ethnographic field trip was at times more of an archaeological mission. One had to dig deep to find the answers. Here is what they found. In almost every town which was part of the project, there had been in the interwar period a photo studio, most often owned by a Jew. In Gródek, the most popular and almost certainly the sole photographer was Josef Abramicki, who happened to also be the town barber. Abramicki was taken to Auschwitz but managed to survive and return to Gródek. Soon after, he sold his house and moved to Canada. In Sopotskin, the ethographers found many photographs signed ‘Berkowski Studio.’ They represent scenes captured at various ceremonies - Catholic and Orthodox... The only ones missing are Jewish scenes. The AK [Polish Home Army] murdered my father. They killed him because he was Orthodox, a local Belarusian. May 2, 1945 in Supraśl. Like all men in the Matejczuk family, he was a shoemaker - he didn’t have anything to do with politics. After the war his brother took his five children and left town. They went to the Soviet Union. Like many others, he feared for his life. 'We were all good friends: Jews, Orthodox and Catholics. There was an orchestra and there all denominations were in it - Abramicki played the violin, and so did my father' says Mrs. Halina. 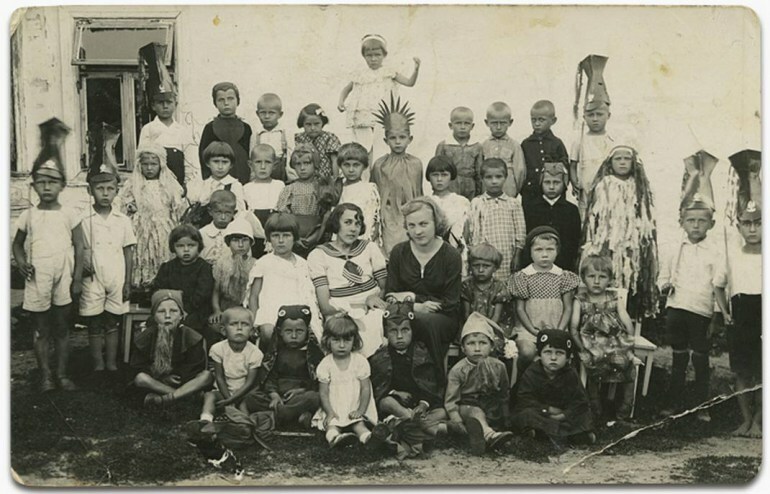 One of the photographs from her collection shows a little girl among other children at the kindergarden. Her parents were famous in all of Gródek, they were a mixed couple and this didn’t happen too often. 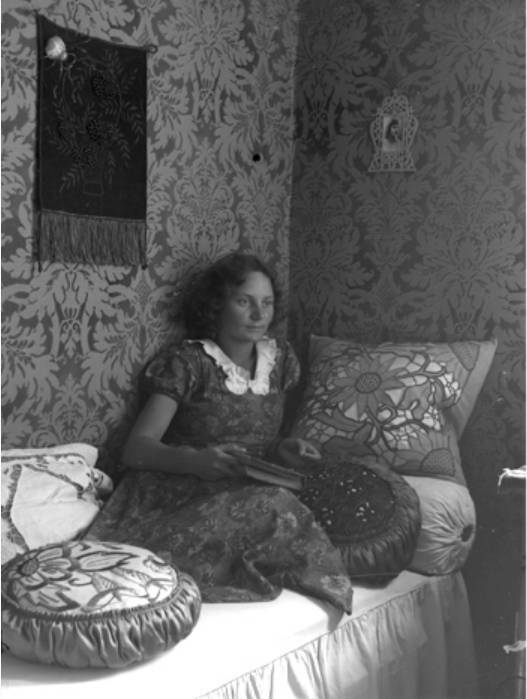 Her father, Motel Morejna, was a Jew, and her mother Luba Januszkiewicz, came from an Orthodox family. And she goes on to tell their war story: the girl’s father died in the bombardment, her mother survived living with a Belarusian family, and the little girl from the picture lives today in Olsztyn but she comes to Gródek in the summer. The Germans ordered that everybody should bring books from their houses and stack them in one place (today there’s a park there). The pile reached the sky, leather-bound books, books with metal buckles, little and big books, a lot of them Jewish. It burned for a very long time. Then it smoldered for a few days. Speaking of the interwar period, Mrs Halina talks of the terrifying policy of the Polish state towards ethnic minorities. She mentions a certain Nadieya Mojsak, a teacher of Belarusian in Gródek, who was incarcerated in Bereza Kartuska (an internment camp for opposition and minorities in the 1930s). And she remembers that ‘Red Gródek’ welcomed the Soviet troops warmly in 1939. 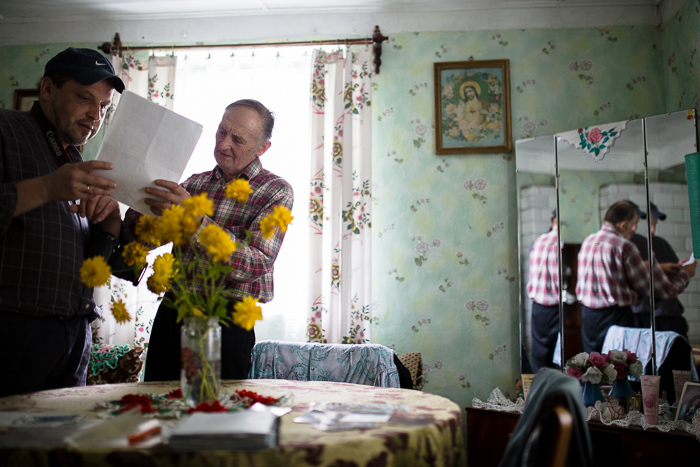 In virtually every house in Kleszczele the members of the project came across photographs taken by Jerzy Kostko. Kostko earned his living as a town photographer from the 1920s until the 1960s. His studio was located in the main street, today called Kolejowa. He died in the 80s. Kostko was an interesting figure. In Kleszczele people remember that he spoke perfect Russian, a rather unusual occurrence in this town inhabited by Poles, Jews, Belarusians and Ukrainians (the idiom spoken in Kleszczele today is a variety of Ukrainian). Some say that his mother was Russian. People perceived him as an eccentric loudmouth. He was the first in Kleszczele to own a bike, and, later, a motorcycle. He also loved women. Although Orthodox, he was on good terms with the Catholic priest and the Jews of Kleszczele. 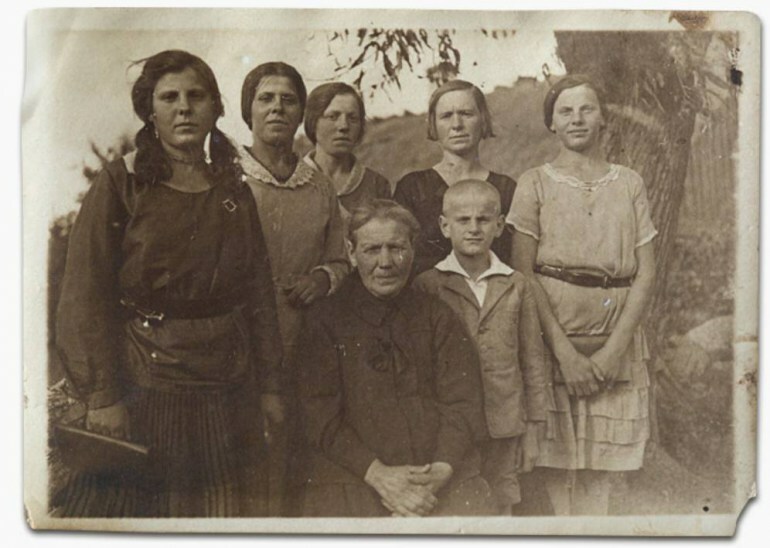 The memories of the oldest people in Kleszczele go back to the bezhenstvo, when Orthodox families fled their homes, afraid of the approaching Germans. 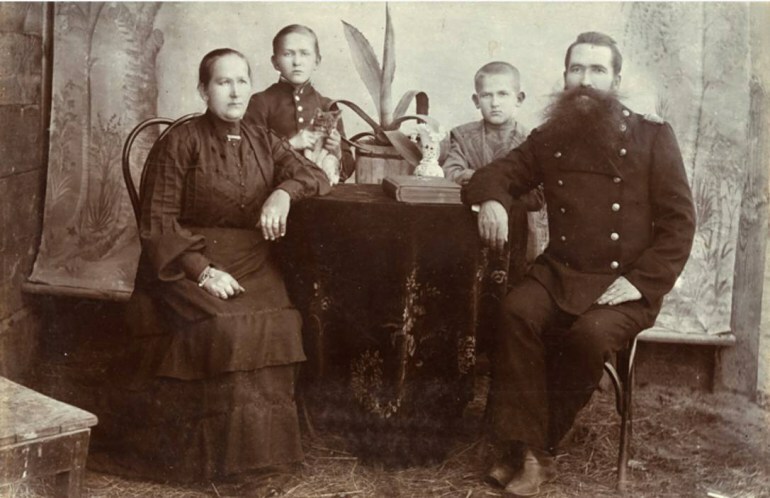 In 1915 and 1916 most of the Orthodox families left Kleszczele and went to Russia - many of them never returned. The history of WW2 is too well-known, say people in Kleszczele. Most of the Jewish inhabitants of the town (making up 40% in 1921 of the population, around 600 people) were probably taken to Treblinka. 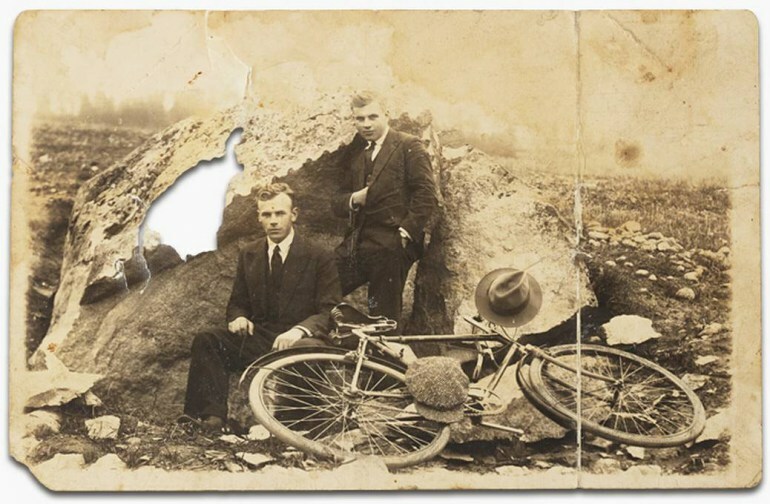 The ethnographers haven’t found a single Jewish photograph in Kleszczele [a few can be found in the Jewish Historical Institute]. However, some of the people of Kleszczele still hold on to school report cards, written in Yiddish, or in Polish and Yiddish. Maria Klimowicz from Dobrowoda, says: It’s evidence of more than school grades. In Lunna, where some of the houses still bear a star of David on the roof, people talk of two exoduses. 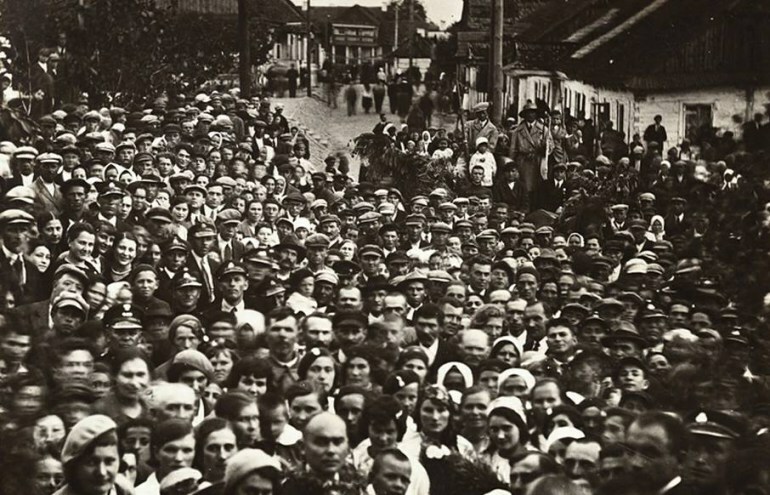 First in 1942, the Jewish population perished, then in 1939-56 most of the local Polish population gradually disappeared - they were either taken to Soviet work camps or escaped the kolkhozy, fleeing to Poland or the West. The centre of Sopockin, where the photographer Berkowski had lived before the whole Jewish population was relocated to the Grodno ghetto, was almost entirely destroyed during the German bombardment of 1944. There is no synagogue and no town square anymore, and the Jewish cementery is overgrown with Sosnowsky's Hogweed. Those who saw Kamenets immediately after the war describe it as a ghost town. Of the 4 thousand inhabitants of the town before 1941, 92% were Jewish. The Christian population amounted to 400 people, and they were the only ones who remained alive. Today no trace of the kirkut remains. Where the oldest one once stood, a bank was built. Now the only trace of Jewish character that remains are occasional Jewish tourists wishing to see the birthplace of their forefathers. The ancient town of Wołkowysk was founded in the 13th century, under the Lithuanian king Mindaugas. For many centuries it was a royal town in the Great Lithuanian Duchy and the Polish-Lithuanian Commonwealth. In the 20th century the Paris-Moscow train stopped in Vawkavysk. The bygone glory of this multicultural town jumps to the eye on pre-war pictures. Even today there remains in the Volkowausk district surprisingly many Poles (30 %) but not Jews. 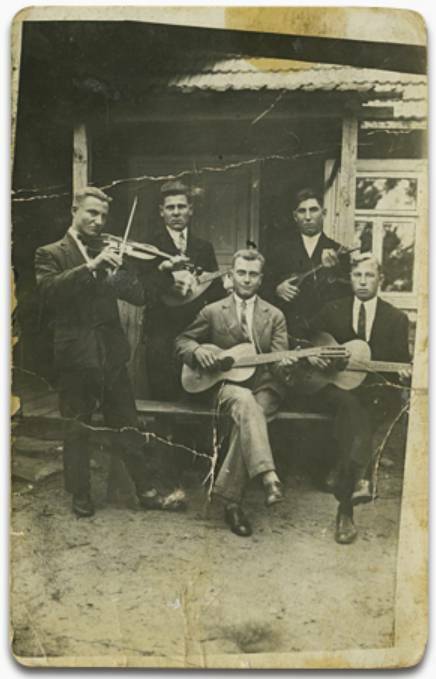 Another series of photographs in the Albom.pl show portraits of four young Polish men. 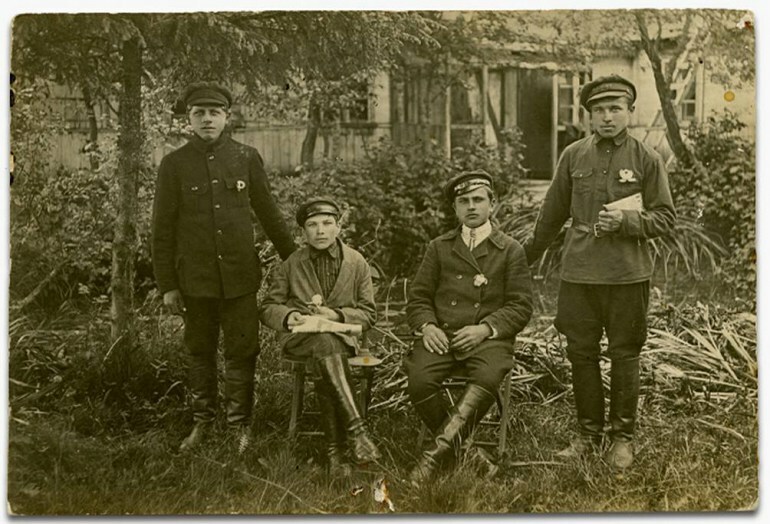 Each of the photographs is captioned with the name of the man and labeled as the secret organization the Four-Legged Liberators of the Fatherland (the photographs come from the NKVD archive). 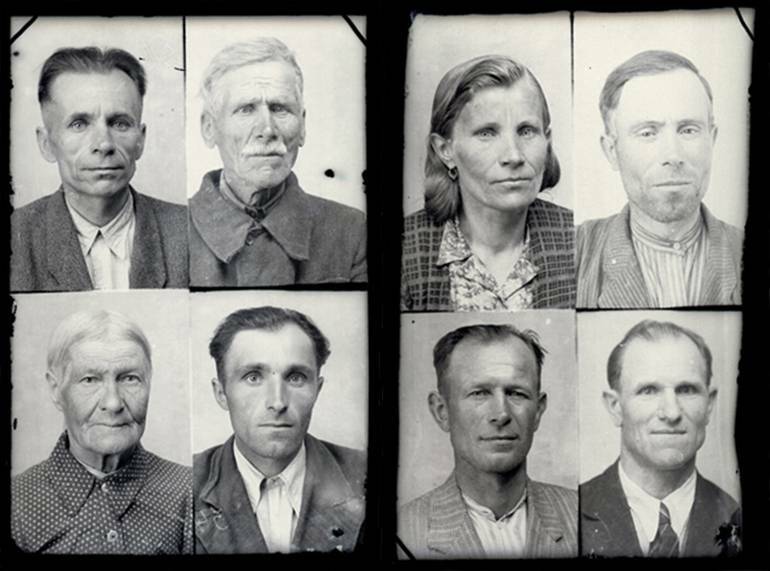 They were all arrested in the 1950 as members of a Polish youth organization and sentenced to 25 years in work camps. Like Vawkavysk, Voupa also boasts a proud past. A once honored town of the Great Lithuanian Duchy, Voupa was a favourite summer destination for queen Bona, and a hunting venue for king Stefan Batory. Not long ago, Voupa possessed a huge 18th-century church and one of the most beautiful wooden synagogues in Belarus. The war changed this urban landscape completely. Almost all of the Jewish population of the town perished in 1942. In the 1950s, it was the houses of Poles that were becoming deserted. Some of them left for Poland, others were sent to Kazakhstan, or Workuta. Each group photo includes people disappeared, or left or died, says one of the residents of Voupa. Цэркаўка-свечка растопла як з воску. Teresa Kudrik, a history teacher in Voupa, who is also in charge of the little school museum, speaks to her pupils about the glorious and tragic past of their town. Together they set out on scientific expeditions in the area, from which they always bring new exhibits for the museum, photographs and stories of people who live here. One of their latest finds are two photos of a Jewish boy -Yudel. The photographs had been hidden in the attic by the father of Mr Gorbachevsky. Judel was his neighbour and a friend, a partner in children’s games. He says he couldn’t bring himself to throw these photographs away. Rummaging in the family archives during the Albom.pl project; photo: Rafał Siderski. The photographical documentation of the project can be found here. The Albom.pl project was realized by Stowarzyszenie Edukacji Kulturalnej Widok, with financial support from Polish Ministry of Foreign Affairs.